Before the renovation took place, the apartment building was a dreary structure, peeling off in places, and needed a smart makeover. 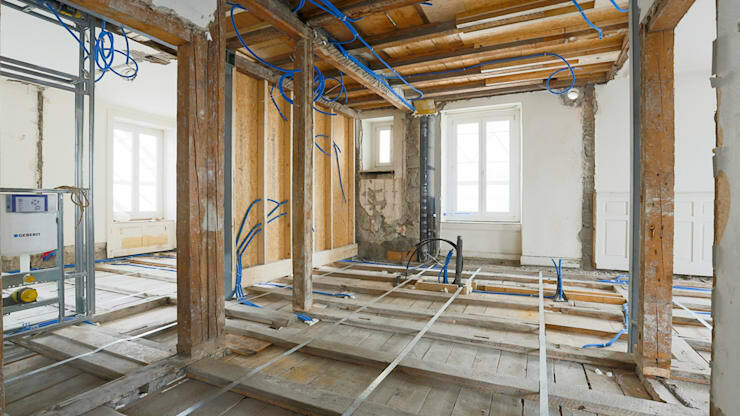 Exposed wooden beams and woebegone flooring made the interiors seem uninhabitable. Here's another look at the original scenario, from a different angle. Luckily, the architects focused on the positives of the building; the presence of ample windows, and sufficient space. And they knew that they could create magic with these! 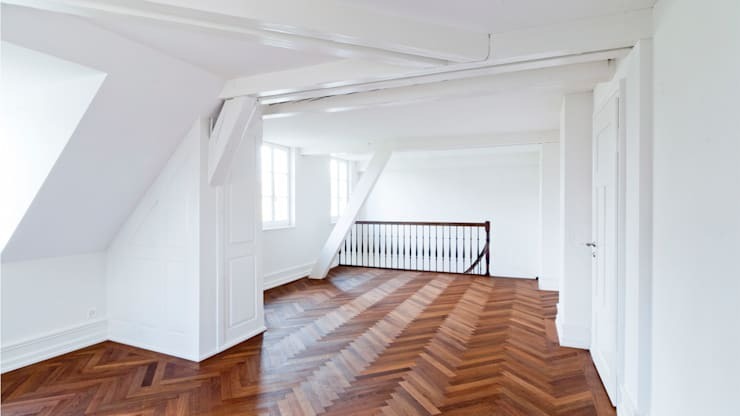 Shown above is the renovated living area of an apartment, with pristine white and rich parquet flooring ruling the roost. The white walls reflect the infiltrating sunshine brilliantly, and make the area appear more spacious than it is. Large doors and windows not only ensure natural illumination, but also allow you to admire the beauty of the outdoors with ease. Beyond the door of the balcony, you can catch a glimpse of the intricate wrought iron railing in white, which adds a quaint bit of charm to the apartment. 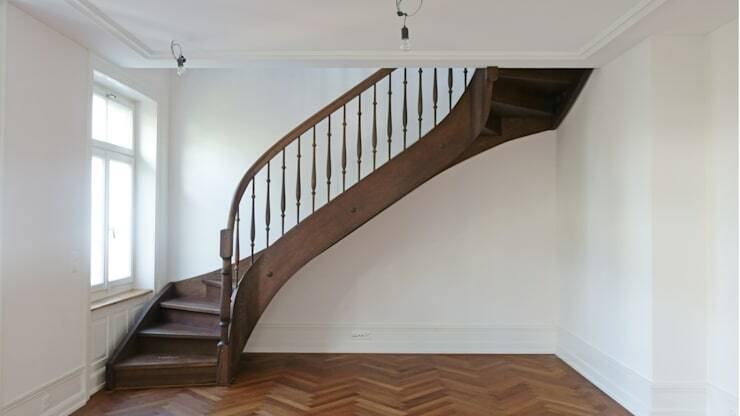 Parquet flooring again makes a stunning appearance in this hallway leading to the staircase. Its geometric symmetry is a visual treat, and fills the space with an inviting and relaxing aura. The white of the walls and ceiling, and the sunshine flooding through the windows make for a refreshing and calm atmosphere. The winding staircase in dark wood is an aesthetic treat, creating a brilliant contrast against the spotless white wall. The balustrade is sleek, strong and minimalistic. Note that there is ample room under the stairway to put together a study or a comfy den for children. White and stainless steel come together to turn the open kitchen into a cooking sanctuary. The large glass doors let in oodles of sunshine during the day, and cheer up the entire ambiance of this space. 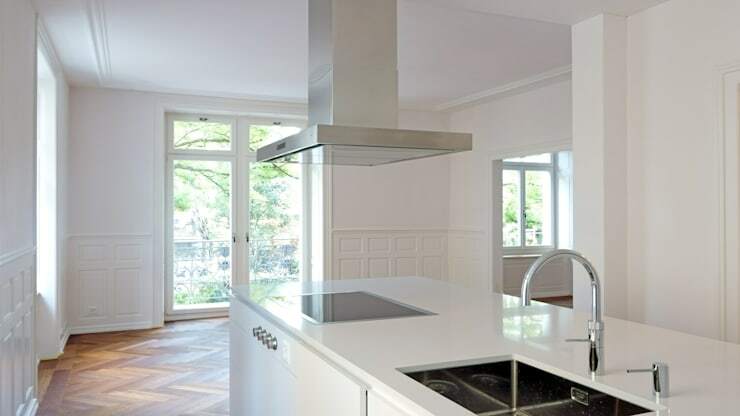 The sleek chimney complements the slim white kitchen island perfectly. The island accommodates a futuristic cook top, a fancy sink, and ample space for chopping veggies and prepping dishes. You can toss up a healthy meal in here, while soaking up the beauty of the greenery outside. 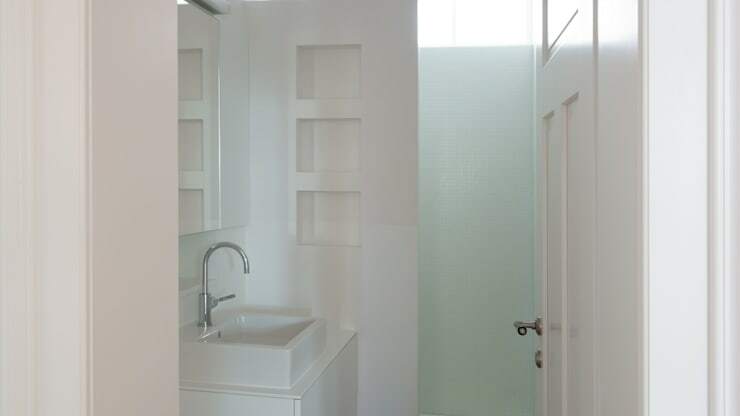 The bathroom has been rendered completely in white, and is a compact but highly functional space. The minimalistic sink comes with storage space underneath, and a column of inset shelves offer space for arranging toiletries. A sleek mirror completes the look of the bathroom. 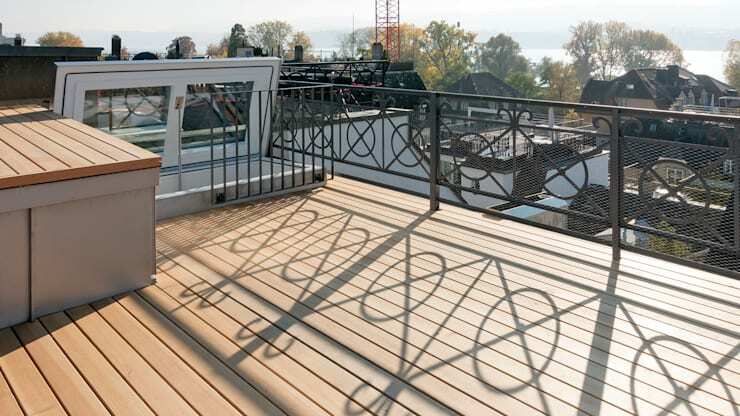 You can’t help but fall in love with the gorgeous and sunny terrace of this apartment building. Slim wooden planks line the floor and exude cordial warmth, perfect for a barbeque or an outdoor party. The black wrought iron railing is geometrically inspired, and lends a note of sophistication effortlessly. You will always yearn to come up here for some fresh air, and to enjoy a sweeping view of the surrounding landscape. 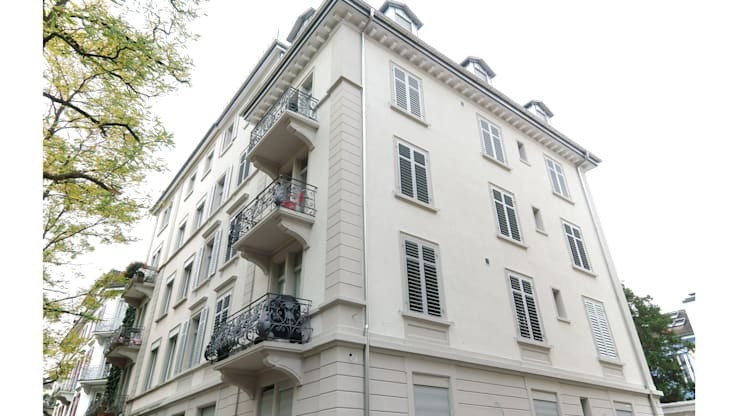 Post renovation, you can see that the apartment building now looks stately and impressive. 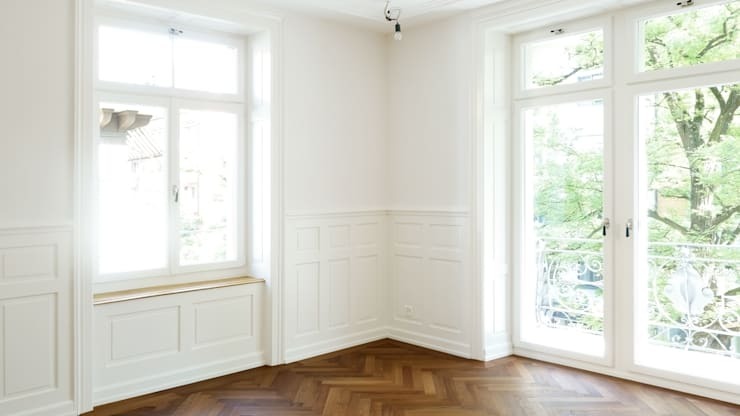 Rendered in white, the architectural accents exude conventional European magic and ample doses of old-world charm. The building now beckons you to enter, explore and make this your nest! Awed by what intelligent renovation can achieve? Here’s another before & after story for more ideas: The dream renovation of a Japanese apartment. 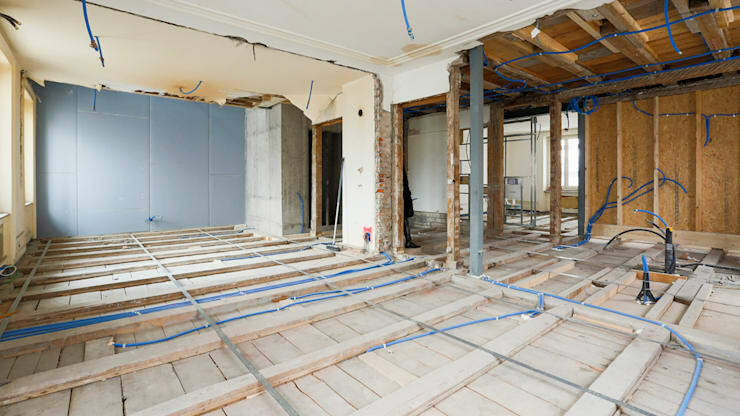 What do you like most about this renovation? Let us know in the comments!